Caterpillar Work Tools recently celebrated its 20th anniversary, marking the event by releasing three new multi-processors. PDi’s Jan Hermansson reports. PDi’s editor in chief Jan Hermansson had the privilege of visiting Caterpillar Work Tools in‘s-Hertogenbosch, more commonly known as Den Bosch, located about an hour by train south east of Amsterdam in the Netherlands in mid-June. 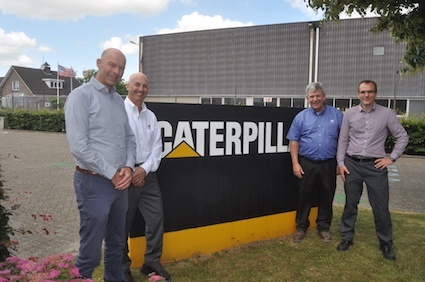 The visit was due to several reasons: firstly, Caterpillar Work Tools is celebrating 20 years at its premises in Den Bosch following Caterpillar’s acquisition of Verachtert, the well-known Dutch manufacturer of demolition, sorting and recycling attachments. Famous for its Verachtert quick coupling range, the company is still a well-known name in the Netherlands. Caterpillar Work Tools provided a full and interesting itinerary with hosts for the day being Bert Heijligers, global marketing consultant, Caterpillar Work Tools, and Francine Shore from Caterpillar corporate trade press relations. The day started with a presentation on the history of the company from its beginnings in the 1950s, to the last 20 years of Caterpillar ownership. Verachtert actually started out in the town of Kerkdriel, and in the beginning, was involved in developing and repairing dragline buckets. In 1979 production moved to Den Bosch, with the company being acquired by Caterpillar in 1998. Today some 250 people are employed, with the Den Bosch factory producing a variety of buckets for excavators and wheel loaders. Bucket manufacturing sees almost 100% of the components being made and assembled at the plant. 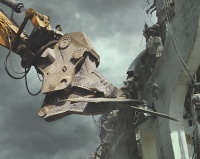 The factory at Den Bosch also produces a wide, all-encompassing, range of demolition attachments including crushers, pulverisers, sorting grapples, shears and so forth. Caterpillar’s range of orange peel grapples are manufactured at the factory, as well as the range of quick couplers and brackets. Most of the components for the demolition attachments are sourced from suppliers in and outside of Europe, with assembly and testing being undertaken at Den Bosch. In order to maximise throughput and quality, Caterpillar Work Tools uses a lane strategy in its manufacturing. Lane 1 offers pre-defined configuration of the most popular models ensuring quick availability. Lane 2 is for specific pre-configured products offering customers more choice. Lane 3 is for generic products which are highly configurable, and therefore with a longer lead time. Finally, Lane 4 is for products engineered to order, and built to customers’ specific requirements. Engineering manager Edward van Amelsfoort gave a more detailed presentation concerning the types of products produced, and for what type of product line (Building Construction, Heavy Construction, Forestry, Industrial and Demolition and Recycling). Amelsfoort also mentioned that Caterpillar offers two lines of hydraulic breakers, the E and B Series (PDi hope to come back with a special report on Caterpillar’s breaker development and manufacturing later this year). Caterpillar also offers H25 to H180 breakers for hydraulic excavators between 0.8t and 80t. Currently, quite a lot is happening at Caterpillar Work Tools in terms of new products. In PDi issue 6 we looked in detail at the two new Cat GSV520 and GSV520 GC orange peel grapples, developed and produced at Den Bosch. We also focused on the new application specific design for the new Cat wheeled material handlers, which are produced in Grenoble, France. What is brand new for this issue are the new Cat multi-processors with interchangeable jaw sets for exclusive demolition features which delivers enhanced productivity. Caterpillar Work Tools has expanded its range of excavator attachments with three new multi-processor models, MP332, MP345 and MP365, which add to the company’s demolition attachment range. They are all equipped with new features aimed specifically at users requiring large, flexible, purpose built tools that can handle virtually any demolition task. The design of the new multi-processors allows pairing a basic housing with any of up to six jaw sets thereby increasing jobsite versatility. The design also boosts productivity with the patented features such as a new jaw locking system and speed booster valve. The new models are compact, and designed with a high power to weight ratio, delivering exceptionally strong cutting and crushing power, while reducing stress on the carrier. Also, the housings used for the new tools incorporate a heavy duty rotator that provides 3600 movement. In operation, when the jaws meet resistance, the integral hydraulic booster valve automatically activates. The ‘speed booster’ system combines a ‘speed’ and ‘booster’ valve enabling the use of a smaller cylinder diameter, which nearly halves cycle time for jaw opening and closing. In addition, depending on the jaw set used, closing force is up to 19% higher when compared to previous series models. This is quite a unique solution since the famous NPK booster patent terminated. The new models are available with interchangeable jaw sets. These include: Concrete Cutter (CC); Demolition (D); Pulveriser (P); Shear (S); Universal (U); and Tank Shear (TS). The jaw sets are designed to be exchanged in as few as 10 minutes using only basic tools. Larger models feature a pin capture system that retains the cylinder pin with the jaw to further enable fast, safe jaw exchanges. Compared with previous designs, the jaw sets have fewer welds (fewer stress points) and more replaceable wear parts. Many wear parts are pinned and can be easily and quickly replaced in the field, saving the time and expense of moving the jaw to the workshop for the cleaning, grinding and welding of new parts in place. Jaw configurations D, CC, and P benefit from parts commonality. In addition, jaw configuration P uses Cat ground engaging tools, while D and CC use the same retention system as the Cat ground engaging tools. The design of the new models provides protection for hydraulic components and hoses, including housing the motor in the frame. The design also allows ready access to the cylinder, which features a protected rod. The number of greasing points has been reduced, compared with previous models, simplifying routine maintenance, which entails only greasing, checking for wear, and replacing worn parts. In addition, each jaw set has a standard transport system, which simplifies moving, storing, and positioning the jaw when making exchanges. The CC jaw set has been designed to precisely cut and demolish concrete, steel beams, and steel structures, simultaneously cutting and crushing large pieces of heavily reinforced concrete with densely packed rebar. The D set is used for primary demolition, cutting and crushing hard concrete, moderately reinforced structures, and rebar. The P demolishes and reduces concrete in a single step, separating rebar from concrete and reducing concrete to small, ready to recycle chunks. The S is designed to demolish steel structures, cutting and reducing the size of metal debris, featuring a piercing tip and wear blade in the upper jaw, and a cross blade with additional guiding blade in the lower jaw. The U jaw set, cuts reinforced concrete into small, manageable chunks for further crushing and rebar separation, and can be used in both primary and secondary demolition. The TS is used for accurate demolition of plate steel, ships, railway cars, tanks (grain, oil, and fuel), warehouses, transit sheds, and other plate steel structures. The MP300 series multi-processors are fully supported by Cat dealers; customers can order parts and service for machines and work tools from a single source. Every Cat work tool is supported with a comprehensive range of pre and aftersales services that include advice about work tool selection, operator training, equipment management, and a range of financial and insurance solutions. Bert Heijligers mentioned that more news regarding demolition attachments can be expected at Bauma next year. After a quick lunch, the day continued with an interesting chat with Caterpillar global product manager Greg Skeels, and global commercial manager Bart Finn, who are both based in Illinois, USA. Skeels pointed out that quite a lot has happened during the last four years at Caterpillar, and in particular at Caterpillar Work Tools. “We are not just selling machines and tools. We are selling a complete solution to the demolition contractor, a top of the line system that will increase efficiency, safety and the complete working experience with all things involved. It is in this direction we will continue to develop,” says Skeels. The new Cat® GSH420 and GSH520 orange peel grapples are set to replace the GSH15B grapples, and have been designed for a wide range of applications. These include handling shredded scrap, such as long structural beams and car bodies; handling rocks at construction sites; and waste at recycling and transfer stations. The performance and efficiency of the new Cat grapples help waste handling operations in particular meet the challenges of increased environmental regulation, growing pressure to recycle a mix of materials, and stringent budgets. The new grapples feature horizontal placement of the cylinders, thus creating a profile that allows for effective material penetration and efficient bulk material handling. The design enhances the strength, reliability and durability of the new grapples, which are available in four-tine and five-tine shell configurations, as well as in closed or semi open versions. In addition, the GSH420 and GSH520 feature a redesigned rotation system, and have been designed to work with the Cat MH3022, MH3024 and MH3026 material handlers. The design of the GSH grapples is constructed out of high grade, impact resistant steel that protects vulnerable areas, such as hydraulic cylinders. For added durability, high quality bushings with lubrication grooves and hardened pins are used in all pivot points. Tines are configured with replaceable cast tips made from a BHN 445-555 material that resists wear. In addition, solid hinge point construction, and robust end stops, ensures long service life, and routing hydraulic hoses within the tines reduces hose wear. All mounting brackets feature a solid pin to keep the bracket in an upright position for ease of installation. Also, the new GSH grapples feature a standard lifting eye on the bottom of the housing for expanded versatility, such as mounting a magnet. The new HR10 rotation group, featuring a new swivel, significantly reduces hydraulic restriction by increasing return flow capacity by 160% and by increasing open flow capacity by 30%. Less restriction results in faster cycles and lower fuel burn.